Since my right arm was out of commission for the last week, I’ve tried to use that time to really nail down some decisions for my kitchen. The main decision that was still undecided was my countertops. When I was planning on doing an interim, quick fix makeover on my kitchen, I was going to do the Ardex Feather Finish. But gradually this kitchen project has turned into a full-blown kitchen remodel, so I don’t really want to consider any short-term countertop solutions. 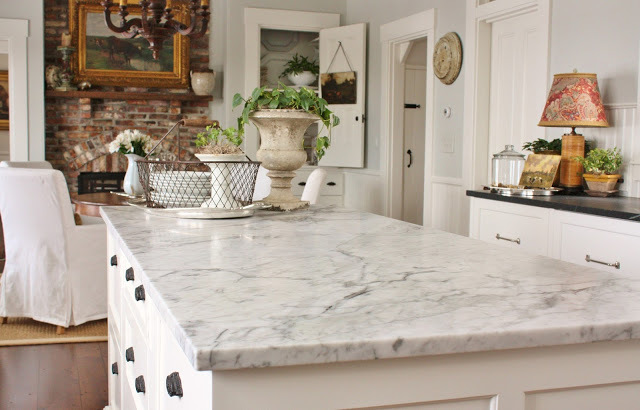 I’ve shared several times that my ultimate dream countertops would be white marble. I know. I’ve read all about how marble etches like crazy, and I had myself convinced that it wouldn’t bother me. About a year ago, Joan at For The Love Of A House wrote a post about her marble countertops, and about how they etch, and how she still loves her marble. They look absolutely gorgeous in her picture perfect farmhouse kitchen. 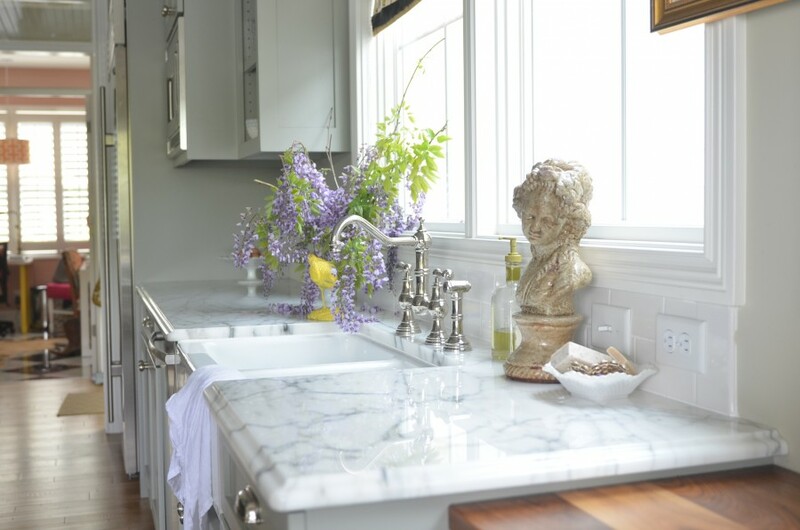 And also about a year ago, Edie at Life In Grace wrote about living with marble countertops, which she put not only in her kitchen, but also in her bathrooms. And then recently, Michelle from 4 men 1 lady shared her experience with living with marble countertops. A year ago, when I read about how easily marble etches (sometimes all it takes is water to make them etch! ), the talk of aging and patina sounded so…I don’t know…romantic, I guess. It sounded so casual, and laid back, and oh so very European. I had convinced myself that it wouldn’t bother me at all. But you know what? It’s time for a reality check. All of those etched water spots, etched rings, etched everything else on my marble countertops that I had spent thousands of dollars on would probably have me curled up in the corner of my kitchen crying like a child who just broke her favorite toy. And seeing that I’m just not a cook, and the kitchen isn’t really a room where I spend a lot of time, and I’ve said a thousand times that I don’t need or want some high dollar gourmet kitchen, it’s just not worth the headache to save up for, and then have to baby, marble countertops. Now what I’ve also wanted for a very long time is concrete countertops! I’ve been dreaming of making my own concrete countertops for at least eight years now, ever since I first read the book about how to make your own concrete countertops by Fu tung Cheng. But my goodness, what a long and drawn out process! 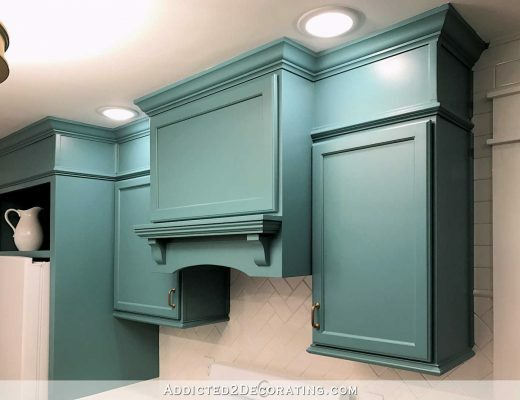 With that method, you have to build your molds from scratch, pour your countertops (upside down), let them cure, break away the molds, and then lift and place the countertop into place on your cabinets. 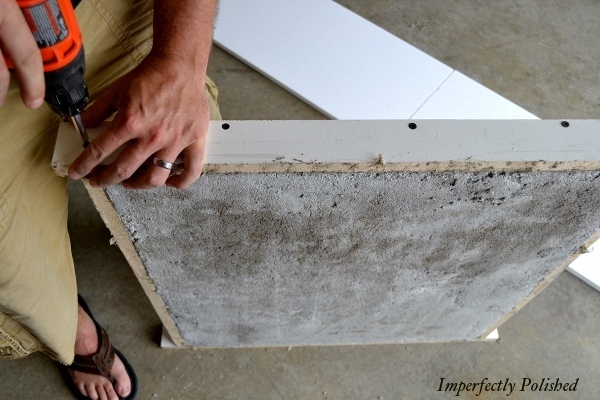 This is the process that Jessie at Imperfectly Polished used to do her concrete countertops. They look great! But wow…what a lot of work. That always seemed so labor intensive. So I was thrilled to find a much easier system about a year ago called Z Counterform, where you use their edge profiles to create a mold, and then you pour the concrete countertops right there in place. Here’s a peek from Modern Mountain Life from last year when they poured their concrete countertops using the square edge profile. You can see that the edge profile molds are just installed right in place. So that’s what I’m going to do! I’m so excited! I even contacted the company last week to see if they would provide the materials and let me show y’all the process on my blog, and they said yes! I spoke with the owner on the phone, and what a nice guy! He’s so helpful and full of info. So I’m going to be using one of their brand new products that’s supposed to make this process pretty fool-proof. Of course, it can be stained or tinted for those who don’t want white countertops. But of course, white is exactly what I want! I’m pretty darn excited. This new product is very similar to their LiquiCrete system (which you can see in the video below), but instead of having a separate product that you then mix with a bag of concrete, it all comes in one bag together — the LiquiCrete and the concrete all mixed together from the start. All you do is add water. So there’s no need to go to Home Depot or Lowe’s and buy the concrete separately! Me, too! Me, too! I can’t wait to pour these countertops, and I am also going with the Z Counterforms in the liquicrete, but I have to ask – how are you going to pour white? Are you going to buy white concrete? I was going to lighten the gray with a white integral color, but am wondering what you have up your sleeve. I’m also going to get my marble fix with the backsplash – I figure that will be much easier to keep beautiful! By the way, this new product isn’t on their website yet, but hopefully they’ll get it on there pretty soon, because I think it’s perfect for us DIYers since it all comes on one bag, and all you do is add water! And evidently it mixes into a smooth, easily pourable consistency just like the LiquiCrete, and you use the same mesh reinforcement and Z clips that you use with the LiquiCrete. Oh my gosh! I am so glad I haven’t done it yet – that sounds so much easier (and I thought it didn’t look too bad before!) Yay! Thanks for letting me know about this Kristi! Very interested in this!! I would love concrete counters in the dream kitchen in my head! Have enjoyed all of your projects but this one I’m reaaaallly looking forward to seeing! I also have wanted to do concrete counters but was put off by the having to pour them and MOVE them afterwards. This sounds so much better! I am excited to see this happen. The hubs loves the idea of concrete countertops. Can’t wait. If anyone can pull that off, it will be you Kristi! Can’t wait to see the finished product. I know it will be fabulous! Hey girl, thanks for the shout out. It’s heartbreaking that marble has to be so high maintenance. It’s like chocolate. It’s so good but not that great for you (at least the amount I eat of it). Boo. Interesting information. All I’ve ever had is laminate counters and I’ve never had a problem. Now that there are stone look -a -likes, I’ll use that. I’m getting laminate floors, too- sometimes faking it is all you can do. Must say..I admire your tenacity and can’t wait to see the end result! Were your concrete countertops pre-cast (cast somewhere else and then installed later), or were they poured in place? If they were pre-cast, do you know if there’s anything under the concrete? Or is it just solid concrete and nothing else (kind of like marble or granite, where if you look underneath from the inside of the cabinet, you see marble or granite)? I’m just hoping that the Z Counterform product will make the difference. I will actually be applying concrete backerboard to the entire area where I want the countertops, and then I’ll pour the concrete mixture over the concrete backerboard. So I’m really hoping that’ll make it completely waterproof, even if a hairline crack develops at some point. It will instantly be worth their while. We bought the book on countertops and were intimidated away by the form building part and have been looking at granite. If yours works out and the process seems easy enough, this is the route we’ll most likely go as well. Ask the company if they can provide your readers with a promo code? I’ll definitely ask them if they’ll provide a promo code. Hopefully they will! I cannot wait to see what you do! I have been wishing I could afford new counter tops after getting some pretty good deals on nice ‘new to me’ appliances and want an affordable way of replacing my old laminate tops. I am pretty sure I will like your finished product and already ready to do the same myself. Slowly redoing my kitchen makeover! I’m ready for this! I don’t think stains will be a problem as long as I seal it really well. is there a resin additive in the concrete? or a resin finish that soaks into the counters? I don’t think there’s a resin additive. You do have to seal it like granite or marble, though. Hmm. It never occurred to me that people would do anything different than pouring the counters in place. Great decision! So happy you are getting a great deal;). Good luck on your new venture and thanks for keeping me in the loop. I’ll be anxiously waiting for the results! After reading this post I just spent an hour on their websit checking out the videos and all the pieces you need to make it happen. There are nothing but fantastic reviews by users of the product. It is not for the budget challenged. Much more expensive than laminate but cheaper than granite. I too bought a book on concrete countertops and was deterred by the amount of work form building etc. this product is so much easier and has a fantastic choice of edge profiles. 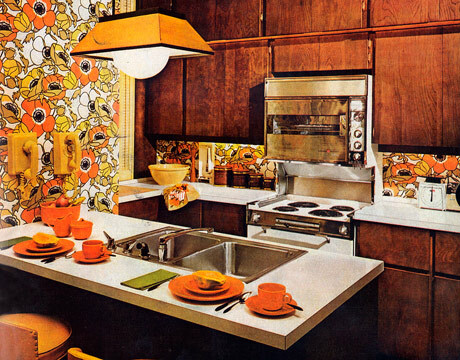 Absolutely the way I will go with my upcoming kitchen remodel. I am so glad you will be trying it first so I can be prepared with your experience. I hope you have a helper for this job. Troweling cement and vibrating the edges would not be a great idea for an already sore right elbow and I would hate to see you in a fetal position on the floor with a half finished countertop. I wish there was a fast forward button on your blog. I can’t wait to see your kitchen finished. So glad you found what you needed and they will provide it for you!!! What better advertisement! You go girl! I have not even read your post yet, just the headlines and had to comment. I cannot wait for this. This will be so much fun. I wish I was in TX with you. OK, now I am going to go back and read what you have to say! You are a rockstar! Wow – they look awesome! Best of luck — with them!!! I got the conformation for the email updates today — HAPPY!!! Looks pretty easy! Also quite beautiful in the video. do the forms give it that edge? I assume that last one was stained. You will be doing yours for free, but will you be able to give us an idea of the cost? This is something I would like to keep in mind for our retirement home. Yes, the forms give it the edge profile that you choose. They have several available. I will definitely give an estimate of the cost. Anyway, I can’t wait to see how this new product comes out and watch your process. Go Kristi!! Way to go! Can’t wait to see how it goes. Maybe we could do it for our kitchen. Love how you just keep on thinking and planning. wow!!! 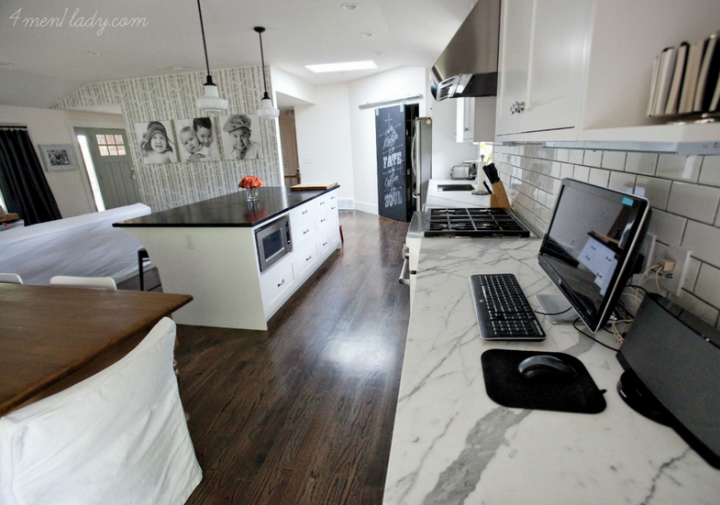 Love your blog… can’t wait to see your countertops.. I am Always looking forward for your next project, in *what is she going to do next*… lol.. Thank you so much for sharing with us all. I have thought of using concrete counters in one of the rehabs but it didn’t look as easy as this does. I am anxious to see how it turns out. Jeannie, I’ve been meaning to ask you, why are you using an IP address as a domain? Why don’t you have a domain name? I don’t know how to change it…..lol. Yes my domain name is http://www.YourInteriorDesignJeannie.com . I see everyone that comments has a nice little title and mine shows up like that, I am so beyond my realm here and need help. PLEASE someone help……lol. You are going to love them. And you are soooooooo right about the long process the other way. I have a post that I never did about the process. Why? Because it takes just as dang long to do the tutorial, it would of been a five part series, and I’m not patient enough to do that. Too bad I couldn’t just post the pics and tell people figure it out! Very exciting! Can’t wait to see how they turn out. Excellent countertops. Very interested in this! I would love concrete counters in the dream kitchen in my head! I have enjoyed all of your projects but this one I’m really looking forward to seeing! 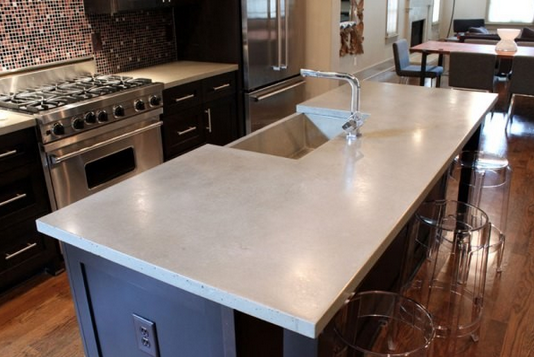 The hub loves the idea of concrete countertops. I know it will be wonderful. If this product works for you, it’s going in all three of my baths, which now have fake marble and I HATE them! Can’t wait to see how it works out. I’m excited and am holding off doing those countertops until you get yours going so I can see how it works. I’ve been planning to make my own concrete counter tops as well. How do you plan to finish the counters with them poured in place without destroying your floors and cabinets? I hear that is a very messy job. In case it’s not clear, by finish I mean grinding, sanding, smoothing, etc. If the floors are done by then, I’ll just cover them with that really thick paper meant for covering floors that you get at Home Depot. I might possibly wait until afterwards to do the floors, though. 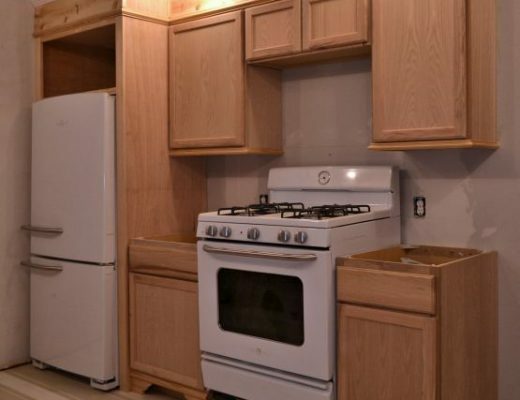 Flooring should go under your cabinets… Also how would you protect the cabinets? Also I don’t think that paper is waterproof? I think you need water to sand them down. The flooring is already under the cabinets, the cabinet will be protected with plastic drop cloths, and in all the videos I’ve watched of pouring concrete countertops, I’ve never once seen anyone use water to sand them down. But the most common method of grinding is wet polishing. Interesting that you haven’t come across that… I’m kind of confused by your flooring statement… Your floors are already under your cabinets or you plan to install them after you install your counter?? From your post yesterday on lighting questions, it doesn’t appear you currently have any flooring installed under your cabinets. Hmmmm Kristi you have me seriously considering this option. I can’t wait to see what and how you do it! I admire your enthusiasm, but you make it sound easier than it actually is. I’ve poured my share of concrete counters, and it’s unbelievably arc work. Unless you are really experienced pouring concrete, I would never dream of pouring them in place. It’s an art, and it takes a lot of practice to get it to look right. The irony is that the more it starts getting away from you, the more you try to work it. Once that happens, it heads downhill fast. If you screw it up, you have a real mess on your hands. Reverse cast that can be made off site allows for mistakes, although you’ll have a seam every 8 feet. Yes, they’re heavy, but that’s when you buy some 6-packs and pizza and have your friends come over! The other thing you are assuming is that concrete has none of the etching and scratching issues of marble… So not true. It may actually be more of an issue with concrete. 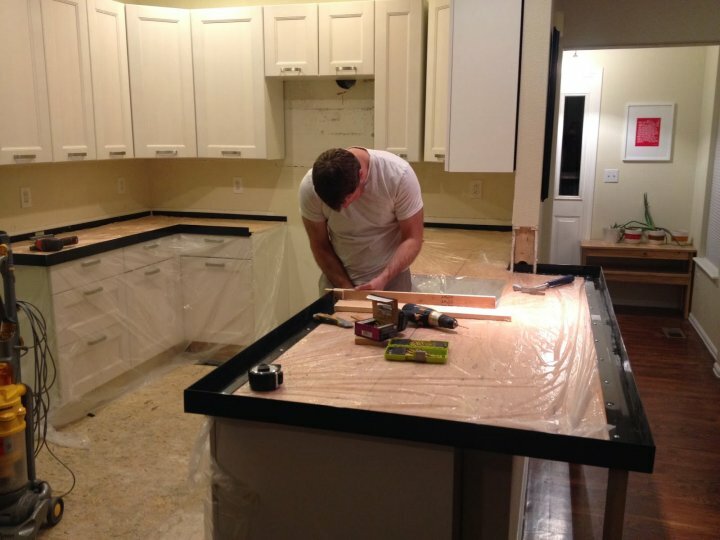 That being said, it can be a cost-effective way to get custom countertops IF you are willing to do the work yourself. If that’s the case, I would still pay to have a professional seal them. The equipment and food-grade sealer are really expensive. If someone is paying for countertops rather than making them, I’d put in a quartz top personally. Similar cost and way more durable. Exactly how do you seal them? There are several concrete sealers on the market that you can choose from.